A paradox: Ezra Pound, James Joyce, Gertrude Stein, and Louis Zukofsky all wrote their central works to be "masterpieces," synoptic views of the world that would change the very consciousness of the public. And yet these writings are so hard to read that instead of producing social change, they have produced critical industries dedicated to decoding them. In new, provocative readings of these demanding authors, Bob Perelman shows how the inaccessibility of their writing reveals the conflict between the goals of social relevance and literary innovation. As self-proclaimed geniuses, they used language in new ways that were inevitably incomprehensible to the large audiences that they sought to instruct, change, or simply dazzle. By seeing genius as a role that is simultaneously social and poetic, Perelman reads the difficulty of their works as rooted in the cultural relationship between authors and their readers. Perelman's brilliant analysis offers scholars new insight and opens these works to readers who have been frustrated by their difficulty. 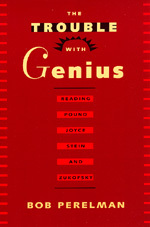 The Trouble with Genius is one poet's passionate attempt to make sense of the stylistic and political challenge of these modernists and to find, although not uncritically, the value of their work for readers and writers today. Bob Perelman is a well-known poet and Assistant Professor of English at the University of Pennsylvania.